Set of embossed flat note cards with matching envelopes in your choice of triple thick stock. 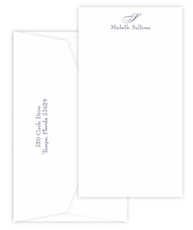 Features a name top center of the note card and an initial above the name in our embossed typestyle. Embossed return address and optional envelope linings available. Size is 8.5" x 4.5".